Girl Scout Promise ~ On my honor, I will try to serve God and my country, to help others at all times, and to live by the Girl Scout Law. Girl Scout Law ~ I will do my best to be honest and fair, friendly and helpful, considerate and caring, courageous and strong, and responsible for what I say and do, and to respect myself and others, respect authority, use resources wisely, make the world a better place, and be a sister to every Girl Scout. Join us for our third season of Girl Scouts at Blaine! Last year Troop #43880 built new friendships, learned new skills, undertook community service projects, went camping, and of course, sold cookies! This year we have a Brownie Troop (2nd & 3rd graders) and a Junior Troop (4th-5th graders). Meetings are held on Sundays from 12:00pm – 2:30pm (September-May). Parents are welcome to drop off or stay for meetings. For more information on the Girl Scouts, please go to www.girlscoutsww.org. 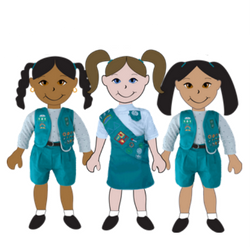 If interested in joining the Blaine Girl Scouts, please contact scout leader Amy Noji @ 206-579-2182 or ahnoji@gmail.com.